Due to my brand presence over at Think Creative Collective I received a Solly Baby Wrap and Swaddles to try out and provide some images. I decided to share our experience further here on my personal blog, because theses products is the bee's knees. I'm gonna be real honest with you here. Before bringing home Penelope (more on her adoption + birth story here) I was terrified of the bonding process. What if she hated me? What if it wasn't this cuddly dream I'd always had? So in order to make my imaginary awful process not so awful I looked into baby wearing. I read all about skin to skin. I looked into the benefits for both mama and baby. And I was hooked. I know that baby wearing doesn't work for everyone, but if you're in the market I cannot recommend that Solly Wrap more. Yes, I know it's pricey. Especially compared to others you can grab at Target (I bought the Boba before I was sent the Solly). The difference between the Boba and the Solly is night and day. They both work the same way (long and scarf like) but the material is a game changer in the Solly. If your kid is anything like mine you'll get nice and sweaty wearing them. She's a freaking heat box and the light and airy material of the Solly counteracts that amazingly (the boba is super thick and extra warm so might be better if you're a polar bear). I was also super intimidated by the long wrap concept (which is why I recommend this one for the early days), but it's super easy once you get the hang of it. Seriously, B could wrap Penelope himself, in the dark, with little sleep. So you can do it. 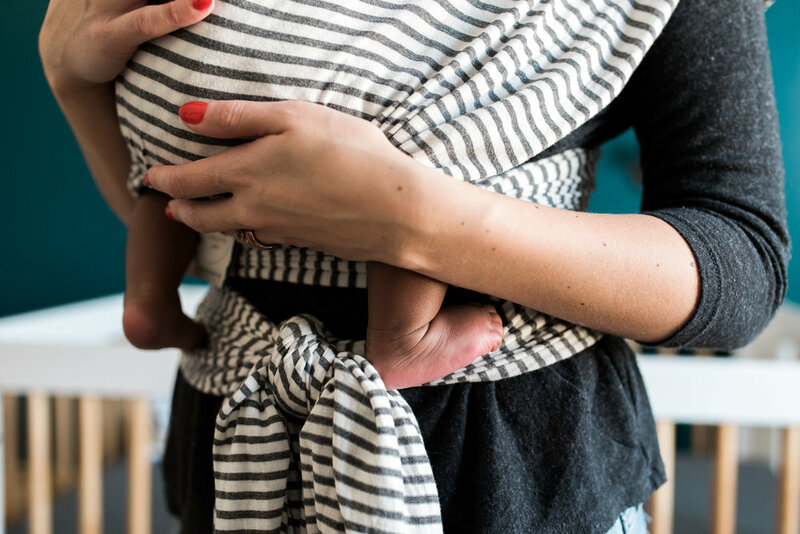 You can find different ways to wear baby on Solly's site and Instagram (they have super helpful tips). Baby wearing really, really was amazing for both of us. Penelope calmed immediately when she was worn in the early days and still loves it now (at 4+ months). It helps me have my arms back and doesn't hurt my back like you might think. If you have any questions about this wrap let me know! Here are some non-profesh pics of our Solly. P.S. I talk about my love for the Wildbird Ring Sling (another way to wear) over here.